Freight forwarder uses Shipping Solutions to quickly create their air waybills. HazMat eXpress was using a typewriter to fill out air waybills. They wanted a way to move into the 21st century with a solution that would automatically print air waybills on preprinted forms. Mike Sweeney, export and IT professional at HazMat eXpress, uses the “print data only” option in Shipping Solutions to print their air waybills on pre-printed forms. The forms have been accepted by many air carriers including KLM, Air Canada, American, Northwest, and Martinair. 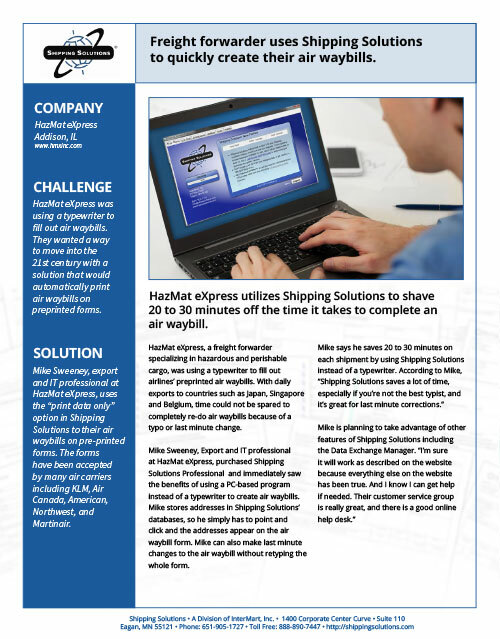 HazMat eXpress utilizes Shipping Solutions to shave 20 to 30 minutes off the time it takes to complete an air waybill. HazMat eXpress, a freight forwarder specializing in hazardous and perishable cargo, was using a typewriter to fill out airlines’ preprinted air waybill forms. With daily exports to countries such as Japan, Singapore and Belgium, they couldn't spare the time to completely redo air waybills because of a typo or last minute change. Mike Sweeney, export and IT professional at HazMat eXpress, purchased Shipping Solutions Professional export documentation software and immediately saw the benefits of using a PC-based program instead of a typewriter to create air waybills. Mike stores addresses in Shipping Solutions’ databases, so he simply has to point and click and the addresses appear on the air waybill form. Mike can also make last minute changes to the air waybill without retyping the whole form.